Hi there! I'm Rebeckah - a Canadian/Norwegian, who was born in Sweden. Growing up, we moved many times, so, I feel like I am from all over the world. Presently, I am living in Panama with my wonderfully supportive husband, who's a national here. I come from a large family where I am the oldest of 8 siblings (3 sisters and 5 brothers), each of whom I like to 'spoil' with my handmade gifts. I blog about one of my most favourite hobbies, crocheting. In particular, crocheting toys because toys are just so much fun to crochet! I hope that my sharing of them helps to spark inspiration and creativity for others who share my passion and admiration of crochet. I thoroughly enjoy crocheting, singing, baking and sewing the most in that particular order. Though, I would have to say that crocheting and singing tie for first place. Someday, I would really like to make dollhouses and crochet for 1:12 scale dolls, and I also dream of taking part in a musical or opera just for the fun of it! Although I don't have any children of my own yet (I'm only in my 20's), pregnancy, childbirth and motherhood are things I am most passionate about. So, I am really looking forward to the day when I will be blessed with little ones to mother, teach, and spoil with the most adorable crochet toys! In the meantime, I am undergoing training as a Birth Doula (childbirth assistant), and I aspire to one day be a Midwife. I am almost always crafting (okay, okay... I mean crocheting), but when I am not, I like to watch movies and BBC TV adaptions of novels (my favourite is 'Sense &Sensibility' by Jane Austen), or research fun information about pregnancy, birth, and babies. I also love to relax in the warm sun and soothing waters of tropical beaches whenever I can. When I was 10, my mother taught me to crochet. My first project was to single crochet (sc) a perfect square. This was to teach me about keeping the stitches even and the same in every row, so that I would be able to tell if I dropped a stitch or added too many. Once I had gotten the hang of that stitch she taught me the double (dc) and treble (tr) crochet stitches. From there, my imagination would spark and lead me to where I am today. Between the ages of 11 and 12, I started to invent simple outfits for my barbies. For the next few years, I would continue to create things here and there. It wasn't until I was 15-19 that I really started to create some really neat things. For these years, and the ones to follow, my focus was on making barbie clothes and accessories for all the different sizes of barbie, even down to the newborn babies. I also made things for dolls and a few purses. My sisters were the recipients of most of my creations. The youngest two would constantly ask me to make this and that. Though still being a student and having many responsibilities a large family brings, I did not have too much time on my hands. So, I made them things whenever I could. Once I moved out on my own at 20, I had much more time to explore all sorts of different techniques. For the next few years, I started to take these new techniques and apply them to my creations; my favourite being things for barbie. However, I also started branching out. I spent some time making accessories like wallets, scrunchies, headbands, and snoods. I also made some doll clothes for my sisters, and when my friend was pregnant, I made her a newborn layette and some slippers for her baby. At one point I made myself a top with accessories to match. One of my favourite techniques that I learned during this time is Tapestry Crochet, also known as Mosaic Crochet. When I came across amigurumi, I wanted to make a bunny that rattled. I used cotton balls as stuffing and a put a mini rattle inside it. However, I couldn't continue to make amigurumi with cotton balls as it would not wash properly. Since I couldn't access polyester fiberfill, I didn't continue to explore this technique. That changed when I came up with brilliant idea to open up a pillow that had the polyester fiberfill inside it. Since doing that I have made several animal friends! A few I followed a pattern, though most I either modified a pattern to suit, or came up with my own design. 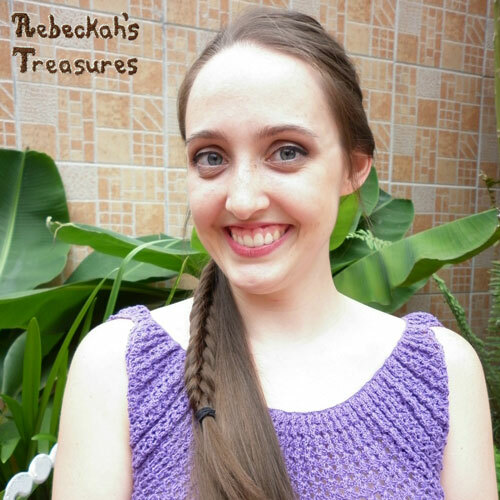 More recently, I received many requests for my crochet patterns. So I have start to make them available. Most of them are for sale, but I also have several that are Free. You can check them out in Crochet Pattern Store, and Free Crochet Patterns. Today, I continue to create many treasures. I hope you will enjoy them, and be inspired by them as much as I have.